Reardon Pallet Company, Inc. manufactures new pallets. 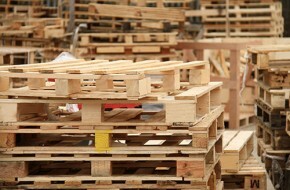 We are able to provide you with a pallet build for any and all of your needs! We are able to get lumber specially for your new pallets and we are able to build pallets in virtually any size. Typically, a standard 48 x 40 pallet is the industry standard for shipping. However, we have been able to make it smaller or larger based on the needs of the customer. Also, we are able to provide the customer with a custom deck board pattern (the amount of space in between boards on the top and bottom decks) as well as customized thickness of the deck board (which typically varies from half an inch to a full inch). Give Reardon Pallet Company, Inc. a call today at (816) 221-3300 so we can help build the pallet needed for your business!